Sometimes we get to open a Christmas present on Christmas Eve rather than waiting for the following day. Sometimes aunt Mildred sends $10 in a birthday card a week early. And sometimes Walt Disney Animation Studios releases the Wreck-It Ralph HD Digital copy a month before it comes out on DVD and Blu-ray. So race to your nearest armchair and fire up your Apple TV or Xbox or whatever you stream movies on and enjoy Wreck-It Ralph earlier than those poor souls waiting on their archaic discs. WRECK- IT RALPH – Walt Disney Animation Studios announces the debut of the hit arcade-game-hopping adventure “Wreck-It Ralph” marking a Disney first with the early release of the HD Digital and HD Digital 3D on February 12, 2013, followed by the 4-Disc Blu-ray Combo Pack, 2-Disc Blu-ray Combo Pack, DVD, SD Digital and On-Demand release on March 5, 2013. * Bit by Bit: Creating the Worlds of “Wreck-It Ralph” – Fans of the film will get a look at five new worlds created for “Wreck-It Ralph.” The short takes viewers into Game Central Station with the artists who brought Sugar Rush, Hero’s Duty and Fix It Felix Jr. to life. * Alternate & Deleted Scenes – Four separate scenes are highlighted with an introduction and optional audio commentary from director Rich Moore. * Video Game Commercials – Viewers can check out the commercials created for the video games featured in the film – Fix It Felix Jr., Sugar Rush, Hero’s Duty and Fix It Felix Hammer. * “Paperman” – This animated short film played in theaters before “Wreck It Ralph.” It tells the story of a young man in an office who sees the girl of his dreams in a skyscraper window across the street. But how can he get her attention? * Disney Intermission: The Gamer’s Guide to “Wreck-It-Ralph” – When the film is paused, host Chris Hardwick appears on screen to guide viewers through a series of 10 video segments offering an inside look at the many video game references, Disney references and other hidden surprises featured in the film. 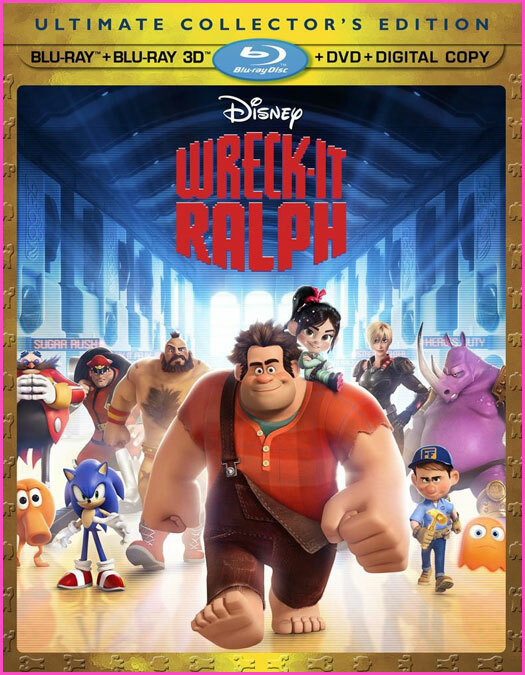 Wreck-It Ralph, featuring the voices of John C. Reilly, Sarah Silverman, and Jane Lynch, releases on HD Digital and HD Digital 3D on February 12, 2013, followed by the 4-Disc Blu-ray Combo Pack, 2-Disc Blu-ray Combo Pack, DVD, SD Digital and On-Demand release on March 5, 2013.